Jenny Lake is one of the highlights of your visit in Grand Teton National Park. Boat, hike, camp, picnic: All the information for a perfect day at the lake is here. Jenny Lake is one of only two lakes in Jackson Hole where motorboat access is allowed, but unlike its larger counterpart to the north—Jackson Lake—Jenny offers a scenic shuttle service across its waters. The area is also home to cozy Jenny Lake Lodge, where charming cabins and fine dining are offered. Plan to have breakfast, lunch or dinner at the lodge; you'll need a reservation if you're not a guest. The lakeshore is split into two self-explanatory zones: South and North Jenny Lake. The South Jenny Lake area has more amenities and is the location of the visitor center, ranger station, campground, and docks. The north area features a boat launch, picnic area, and trailhead but on the whole, North Jenny Lake is a bit quieter and has fewer crowds. Like most locations in Grand Teton National Park, Jenny Lake is easy to find. Multiple signs indicate the North and South recreation areas from the Teton Park Road. Seven-day park passes cost $30 per car, $15 per biker or hiker, and $25 per motorcyclist. IMPORTANT NOTE: Parking is limited at the lake this summer due to construction and you most likely will need to park on the road and walk in. We suggest you visit early in the morning or late in the afternoon to avoid the crush of crowds. After you've gotten your pass and parked your car, there's only one question left: What to do? Stop by the Jenny Lake Visitor Center to jump start your adventure—during construction this summer, a temporary visitor center will be open in the north parking lot. Featuring informational displays and interactive presentations, the visitor center acquaints guests with the area's natural history and geologic significance. Beginning on June 1, the Jenny Lake Visitor Center opens daily from 8 a.m. to 7 p.m., until its fall closing date of September 1. You can take a short walk from the visitor center to pick up backcountry permits at the South Jenny Lake Ranger Station, stock up on provisions at the general store, or book trips and glean wisdom from the local office of the legendary Exum Mounatin Guides. Hiking around Jenny Lake gives you unique views of the Tetons without the demanding climbs typically required to explore the backcountry. The glassy waters and various tributaries that compose this corner of the Snake River watershed provide a rich opportunity for wildlife viewing of all sorts. Be mindful of the weather, for it changes quickly, and be sure to stay hydrated while you're trekking around. Just because you can see water and feel a cool breeze doesn't mean you shouldn't refill your water bottle every chance you get. The Jenny, String and Leigh Lake trails are all popular routes for day hikers. As you'd expect, the 7.1 mile Jenny Lake trail loops its namesake and the 3.7 mile String Lake Trail does the same. The Leigh Lake trail, on the other hand, is an out-and-back hike that follows the eastern shore of Leigh Lake. Hidden Falls and Inspiration Point are also huge hiking destinations accessible from the Jenny Lake shoreline. Read more about this range of short hikes here. What would a trip to the West be without a little "roughing it?" Camping in a National Park is one of the easiest ways to get your boots dirty and enjoy a peaceful camping excursion and the Jenny Lake campground is one of the park's most popular locations for overnights. All campgrounds in Grand Teton National Park cost $32 a night per site, or $16 for seniors and cardholders. Reserve and pay for your campsite at the campground entrance—signs are posted at all Grand Teton National Park entrances regarding campground vacancies. Whether you rent a canoe or kayak at the South Jenny Lake docks, launch your own motorized vessel (provided its engine is sub-10 horsepower), or take the one and only Jenny Lake ferry, the lake's glassy waters are ideal for an afternoon voyage. Kayak and canoe rentals are available from Jenny Lake Boating for either $20 per hour or $80 per day. Rentals are first-come, first-served. Motor boating permits can be acquired at the visitor center, and cost $20 per day or $40 annually. Part scenic-tour, part water-taxi, the Jenny Lake shuttle is like nothing else in Jackson. The ferry departs from South Jenny Lake roughly every 15 minutes and carries you across the water to the Cascade Canyon trailhead. From here, you can check out Hidden Falls, Inspiration Point, or a different section of Jenny's lakeshore. Round trips on the Jenny Lake shuttle cost $18 for adults, $15 for seniors (age 62 and older), and $10 for children. One way tickets are $10 for all adults and $8 for children. There is no fee for children age 2 and under or adults over 80. We recommend going in the morning or late afternoon to avoid some of the crowds. 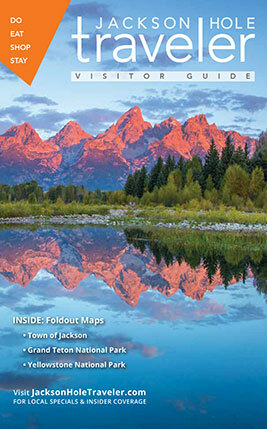 Jackson Hole's multi-use pathways broadened the horizons of fun for visitors to Grand Teton National Park. You can ride your bike all the way up from the town of Jackson, or choose one of two loops contained entirely within the park: the 8-mile jaunt that connects Moose to the South Jenny Lake area, or a shorter 4-mile trip that spans from the Taggart Lake trailhead to the shores of Jenny Lake. With these pathways, Grand Teton National Park now boasts the largest amount of bike-friendly terrain in the nation. In order to reach the famous Cascade Canyon Overlook—a definite photo must during your time in Grand Teton National Park—follow the signs at the North Jenny Lake Junction. From there, you'll travel a narrow, one-way road back to the South Jenny Lake Junction, stopping at the overlook along the way. Be aware that pedestrians and bikers may also be using the road, not to mention deer, moose, fox, and black bears: Drive slowly and give them a brake. We are a private, 501(c)(3) nonprofit organization whose mission is to fund projects that enhance Grand Teton National Park’s cultural, historic, and natural resources and to help others learn about and protect all that is special in the park.